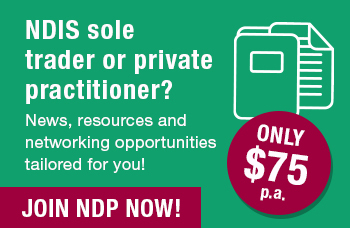 Free 20 minute over-the-phone advice for NDP sole traders! To celebrate the launch of NDP’s ‘NDIS and sole traders’ hub, Nexia Australia is pleased to offer NDP members a free 20 minute over-the-phone consultation on any business-related issue. This free consultation period will help point NDP sole traders in the right direction as well as answer any quick queries. As well as this, the consultation can help NDP sole traders identify potential issues that may affect their business. Should a prolonged consultation be required, NDP members can access a 10% discount on Nexia Australia fees. Hurry! Offer ends 30 June 2019. The helpline operates during business hours (8.30am-5pm, Australian Eastern Time). Nexia Australia will endeavour to respond to queries within two working days. NDP members can access one 20 minute over-the-phone consultation free of charge until 30 June 2019. The complimentary consultation is valued by Nexia Australia at $150. This offer is valid for 'NDP sole trader' members only and can only be initiated by NDP's online form. Nexia Australia is an independent business consulting and accountancy firm. The advice provided by Nexia Australia to you under this terms of our introductory business consulting offer is advice from Nexia Australia only. Neither National Disability Practitioners (NDP), a division of National Disability Services Limited (NDS) or NDS itself can be held responsible for the information or advice provided, or any other matter arising out of the free 20-minute call. To take advantage of the offer, you will be required to complete a referral form in which you provide your contact details, state the nature of your query and when best for Nexia Australia to contact you. We will validate to Nexia Australia that you are eligible for the free business consulting offer (if you are) and pass the referral and your personal information to Nexia Australia. By providing us with the referral form you authorise us to release the information to Nexia Australia. If additional work is required outside the free 20-minute advice, Nexia Australia have agreed to provide a written quote to you for any additional work but will only do so if such additional work and quote is requested by you. You are free to negotiate such terms as may be suitable to you and Nexia Australia for any future work. NDP is not a party to that agreement and is in no way responsible for any matters arising in the initial advice, or any matters arising from any continuing relationship between you and Nexia Australia.